Could Ahmadinejad End Up Under House Arrest? The scenario that Iran’s president Mahmoud Ahmadinejad could end up under house arrest can not be dismissed. Comments Off on Could Ahmadinejad End Up Under House Arrest? Iran: another liquidation by internal forces? Comments Off on Iran: another liquidation by internal forces? Did Israeli drones disrupt Iran’s satellite launch? The article below in Haaretz looks at a recent report from Iran that hostile unmanned aerial vehicles disrupted the communications systems at the launch site of a missile carrying Iran’s first satellite to space. The question is, who was behind this? 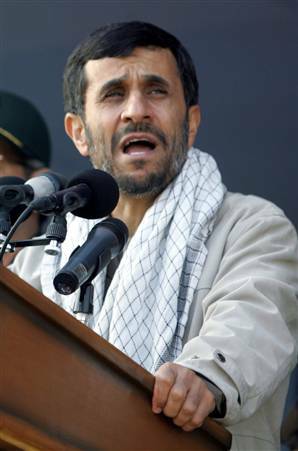 Since becoming president in 2005, Mahmoud Ahmadinejad has become one of the most widely known Iranian politicians. In direct contrast, his wife has been one of the most discreet spouses in Iranian political history. The world got its first glimpse of her in 2005, after she accompanied her husband on a trip to Malaysia. However, she did not speak any words and has hardly ever appeared in front of cameras since then. What was even more mysterious was her identity. She was only referred to as Mrs. Ahmadinejad in the very few reports which mentioned her. Her real identity was strongly protected. The people of Gaza have been subjected to aerial, ground and sea attacks and have been living under siege for a long time. Witnessing the bombardment of mosques, hospitals and houses and the mutilation of women and children brings pain to the heart of any human being. …I ask you to do whatever is in your capacity to help the people of Gaza and to help them from the oppression that they are suffering from, so that your name is placed alongside the name of worthy and peace seeking women. One could doubt whether Mrs. Ahmadinejad’s letter would have any impact, because these days Egypt is trying its best to isolate Iran. This was seen by the fact that Mahmoud Ahmadinejad and Iran’s Supreme Leader Ayatollah Khamenei on several occasions asked for Mubarak’s help. Nothing ever came of it. Nevertheless, the symbolic value of the letter should not be ignored. Many people around the world believe that Iranian women, especially conservative ones, are confined to the boundaries of the kitchen. This may be true about wives of conservative clergy. However when it comes to non-clergy conservatives, the opposite is true. Quite a few are very vociferous in their political thinking and beliefs. One of the most notable is Fatemeh Rajabi, the journalist wife of Gholam Hossein Elham, a government spokesman and one of Ahmadinejad’s most trusted confidants. Rajabi sometimes appears in the press more often than her husband. Furthermore, she has openly attacked Rafsanjani’s allies for being corrupt and Ayatollah Khatami for being too liberal and friendly toward the West. She even called for the defrocking of Khatami. Although many male members of Iran’s political elite have done the same, Rajabi is the first female critic in Iran’s post-revolution history to go so far in her criticism of senior politicians. This has earned her several nicknames. One is “Fatti Arreh,” meaning “Fatemeh the hacksaw.” The other is “Shamsi Pahlevoon,” a nickname given to physically rough women in Iran. Despite the fact that Ahmadinejad’s wife has been camera shy until recently, she too has had a strong influence on her husband. Although the president of Iran is no feminist, compared to other conservatives in Iran he has championed more rights for women. One of them was his public call to allow women to attend soccer matches as spectators. Soon after, he was subjected to fierce criticism from senior clergy from the city of Qom because they saw it as un-Islamic. Ahmadinejad did not back down until he was forced to by Iran’s supreme leader. Furthermore, during his tenure as mayor of Tehran, Ahmadinejad opened many leisure areas for women, including parks and libraries. Although segregation of men and women is frowned upon in the West and by many Iranians, it must be noted that some women in Iran welcome segregation in buses and parks due to problems such as unwanted physical contact and approach by strangers. Right-wing movements have also increased their recruitment of women for their campaigning and demonstrations. A great number of Baseej (people’s militia) who demonstrated against Israel and Egypt were women. As the Iranian presidential elections near, we are going to hear more from the female members of Iran’s political arena. Their appearance is not solely for the betterment of human kind. Jealousy and self-interest are also at play. It is believed that one of the reasons why Ahmadinejad’s wife wrote to Suzanne Mubarak is because she did not want to be outdone by Zohre Sadeghi, the wife of Ayatollah Khatami (Ahmadinejad’s chief rival), who two days earlier had written a similar letter to the wife of the emir of Qatar. Conservative clergy may wish to keep Iran’s women quiet and at home. However, it looks like the conservative non-clergy politicians who should back them are actually turning against them. Sixty percent of Iran’s university graduates are women. It’s only a matter of time before they can slowly claim their deserved place in the government and society of their country. Aradan, a small village in the Semnan province of Iran, is the birthplace of president Mahmoud Ahmadinejad. Its local population does not exceed 5000. Most are Persians. There are also some Gilak speakers. These are people who emigrated from the Gilan province, in northern Iran, where they have their own dialect. Aradan has an old Bazaar and a number of old mosques, which are in a dilapidated state. Its only tourist attraction is the grave of five Arab pilgrims, who died there on their way to the shrine of Imam Reza in Mashhad, in the 18th century. If the regime ever collapses, in my opinion, it is very probable that the start of its end will be traced back to the administration of Mahmoud Ahmadinejad as president. Because in terms of economic welfare, since the start of the revolution, life has never been so bad for so many Iranians. These are some of the accusations leveled at Iran’s president, Mahmoud Ahmadinejad. There is valid reason behind all of them and they are why many countries do not want Iran to have a nuclear weapon. This is despite the fact that if and when Iran does get the bomb, Ahmadinejad’s finger will be nowhere near the launch button. Iran’s Supreme Leader Khamenei will make sure of that. Unlike Ahmadinejad, Asif Ali Zardari Pakistan’s new president, will have his finger on his country’s nuclear button. So it will be interesting to know about his background. This is in addition to his reputation as a corrupt businessmen. Pakistan’s case is one of many problems for the US, and it could be about to become much worst. Its population dislike the US more than many other countries in the region, while Al Qaeda is becoming more influential in Pakistan, where it has reached into the country’s influential secret service (ISI). Pakistani Al Qaeda is also making notable progress in its fight against the Pakistani government. For example, it is now in control of roads leading to the city of Peshawar, which has 3 million inhabitants. That would be equivalent to the city of Chicago being surrounded by outlaws, with the US armed forces unable to break the siege. The Iranian nuclear program is a cause for concern for the West, with much validity. However, equally dangerous, if not more, is the situation in Pakistan, which already is a nuclear country. Just as Saddam’s Iraq took the attention of the West away from Iran’s nuclear program, the current absolute focus on Tehran’s nuclear ambitions may do the same to the troubles in Pakistan. Comments Off on Finger, Nuclear Button, Prozac?